As its name might imply, the Million Dollar Sunday is a tournament that takes place on a Sunday and guarantees a cool $1 million in prizes. This event doesn’t run every week at Americas Cardroom nor even every month, but it is a recurring special that happens a few times per year. When it is scheduled to go, you can be certain that serious MTT players clear their to-do lists for that day. This is the largest online poker tournament, by money awarded, that U.S. residents can participate in. The Million Dollar Sunday costs $500 + $40 to join, and it pays out a minimum of $1,000,000. The starting stacks are a respectable 10,000 chips, and the first level of blinds is 15/30. The blinds increase every 15 minutes. Late registration is typically open for five whole hours, allowing people to succumb to the temptation to enlist in this huge MTT even at the last minute. 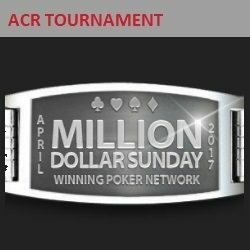 There have been considerable overlays in the past with ACR having to kick in six-figure sums to meet its commitments for the Million Dollar Sunday. However, as word spread about the tournament, more and more people entered, and the last few Million Dollar Sundays met their guarantees. Still, there may be a chance to pick up some of the site’s money depending on seasonal fluctuations in player traffic volumes. Due to the fact that it has to cover any shortfalls in the prize pool, Americas Cardroom wants to fill as many seats as possible. To this end, it always runs a full slate of satellites to any Million Dollar Sunday that it hosts. It’s possible to win your seat for as little as $6 + $0.60. Some of these satellites can themselves be entered through sub-satellites. If fortune is with you, you can parlay $0 into a first place finish in the Million Dollar Sunday, worth somewhere around $200,000 or more. Boost your bankroll in preparation for entering the Million Dollar Sunday by reading our Americas Cardroom bonus review and scoring some free bonus cash. Play in the Milly. Sign up for ACR here!